Logline: During a reunion trip on an island two women, who were once childhood friends, are haunted by events from their past. A handsomely mounted production, this supernatural chiller plays on the memory and loyalty, and of the blurry lines of morality when fogged by juvenile intent. Two adult women are brought together but find their friendship tested when a tragic event from their childhood rears its head and threatens to ruin their lives. Hanna (Mina Tander) works as a physician at a large hospital, and attends an overdose victim Clarissa (Laura de Boer) who recognises her. The two women immediately rekindle a long-dormant friendship. Spontaneously they decide to revisit the island where they holidayed as children twenty-five years earlier. Hanna needs a break from her adulterous husband and brings her 7-year-old daughter Lea (Lina Kolhert). But the island holds a dark secret that Hanna has conveniently forgotten about. Clarissa hasn’t. And neither has the local fishmonger Gabriela (Katharina Thalbach) whose daughter Maria (Mia Kasalo) died under tragic circumstances all those years ago. There are ruins in the forest that harbour those dark memories, the guilt and the vengeance. Alex Schmidt directs with an assured hand and gets great atmospheric mileage from the location shooting on the island. The two female leads are very charismatic and their strong performances keep the narrative conceits at bay. There’s a few twists and turns, with the most dramatic one near the end, and whilst not a doozy, it gives the movie a much-needed kick-up the backside, as things have sagged by the end of the second act. Forgotten plays mostly as a mystery thriller, but there are some nice visceral moments, and things certainly get rather bloody in the climax. The German title translates as You Promised It, a reference to the young girls’ game playing. But there is a parallel board that the adults find themselves on, and its unsure who’s playing who, and just how the game will play out. 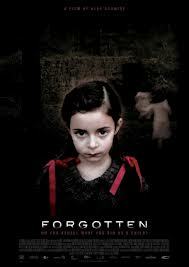 Forgotten plays as part of the Australian German Film Festival and screens in Sydney’s Palace Verona, Thu May 9, 6:30pm, Melbourne’s Palace Coma, Sat May 11, 8:45pm, and Perth’s Cinema Paradiso, Sat May 11, 9pm.